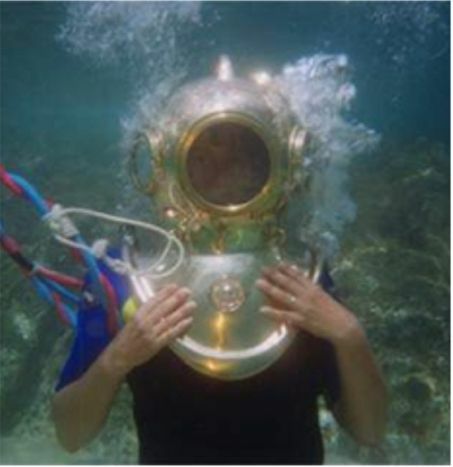 This diving helmet, which refers to the well known old diving helmets, is especially developed for use in the tourist industry. Almost every person, with or without diving experience, can experience an “Underwater Walk” in shallow depth and enjoy the wonderful aquatic life. The cast bronze helmet is worn on the divers shoulders. Under water, it weighs just a few pounds. Air is delivered into the helmet by a surface air supply unit. The air is trapped in the helmet and enables the diver to breath freely. Redundant air mixes with the exhaled air and leaves the helmet from the open underside. Three ports supplies the diver with a great view. Optionally, the helmet can be fitted with a communication set. Diving with this helmet is very safe. Nevertheless, diving with the Dutch Diving Helmet always requires a brief instruction and must always take place under qualified instruction. PADI and some other diving organizations have implemented this activity in their program. 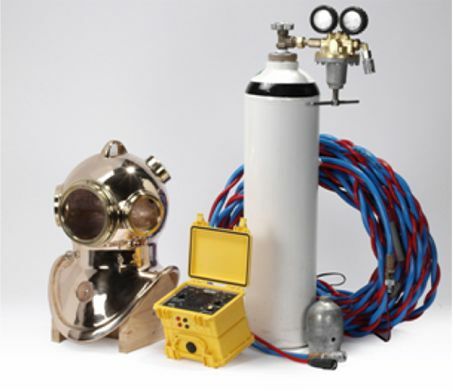 Dutch Diving helmets can also deliver the necessary hardware like communication sets and air supply units for one or more divers.